What will it cost to have the firm collect a debt? Will litigation be necessary, or can it be avoided? If the case has to be litigated, what steps must be taken to prepare for court? When and how are attorney's fees and court costs paid? Can collection fees, costs, and even interest, be added to the sum collected? What role will the client play in the collection process? What documents and other materials and information will be needed from the client in order to maximize recovery? Will a client representative be required to appear in court, or at an out-of-court proceeding such as a deposition? How long will the collection process take? What should the client do to avoid the future need to employ collection efforts? 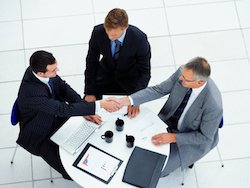 New clients typically contact the firm with these and more questions. They are often confused and aggravated. Frequently, they are concerned primarily with the fact that collection efforts are distracting them from their business goals and disrupting their cash flow. Sometimes, and all too often in a difficult economy, the very survival of the client's business depends upon successful collection efforts. The New Jersey collection law firm James S. Friedman, LLC, strives to clarify client concerns, and collect outstanding debts as efficiently as possible. As a threshold matter, we accomplish this by responding as thoroughly as possible to these and other client inquiries at the initial consultation, and while a matter is progressing. Until the process is completed, the firm works diligently to keep clients up to date concerning the status of cases. Clients typically receive periodic status reports via e-mail concerning their cases. The firm uses the latest available technology to manage collection cases, and is always seeking to identify and implement new ways to maximize the value and efficiency of its services. We believe that employing cutting edge technology at every stage of the collection process benefits our clients by helping them to make the best of a bad situation and ultimately achieve their business goals. Because of the value James S. Friedman, LLC, places on client relationships, the firm will work much more diligently than a collection agency to collect your outstanding debts. Most collection agencies send a few computer-generated letters and make some phone calls, and then give up when nobody responds. We do not stop there. Our approach is dramatically different. If the circumstances call for it, we will go the distance through the entire collection process in pursuit of our client's money. Finally, because we are a small firm, we can offer more individualized attention to our clients, as well as flexible fee arrangements that are virtually unheard of in large law firms or "collection mills". Our goals include providing a contemporary level of services in an old-fashioned way. If you have questions regarding outstanding obligations owed to your business, call James S. Friedman, LLC, at 800-361-6554 (toll free) or contact us online to learn how we can help you collect them.